My classroom in Moldova that I taught in for most of the two years since I initially taught on the third floor of the building for a few months until we were moved to the first floor. Some key elements to take notice of is the giant poster in the back of the class. Every single Moldovan classroom will have a poster of some sort of beautiful landscape. I would assume it gives the teacher something nice to look at while they are teaching. But for me it had a lot of practical uses and I can't begin to number the amount of times I used to illustrate a new vocabulary word we were learning that I somehow found a way to tie into that landscape. 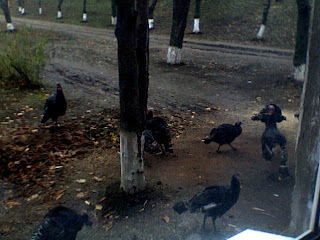 The turkeys that set up shop outside my classroom window on Thanksgiving to not only remind me that I had to go to school but also that I wouldn't be getting any Turkey on Turkey day. And lastly in the winter time the furnace that heats the school is right by my classroom so whenever the horse drawn cart full of coal pulls up next to the furnace the horse is perfectly positioned at the window to my class, which is always the biggest distraction you can imagine.